scientists at the Technische Universität Wien (Vienna University of Technology) believe they have found a very elusive particle: a glueball. Glueballs are unstable particles made up entirely of gluons, the bosons that carry the nuclear force that makes protons and neutrons stick to each other inside atomic nuclei. The gluon is usually considered analogous to the photon. They are both massless, and just as photons carry the electromagnetic force between charged particles, gluons carry the strong nuclear force between quarks. 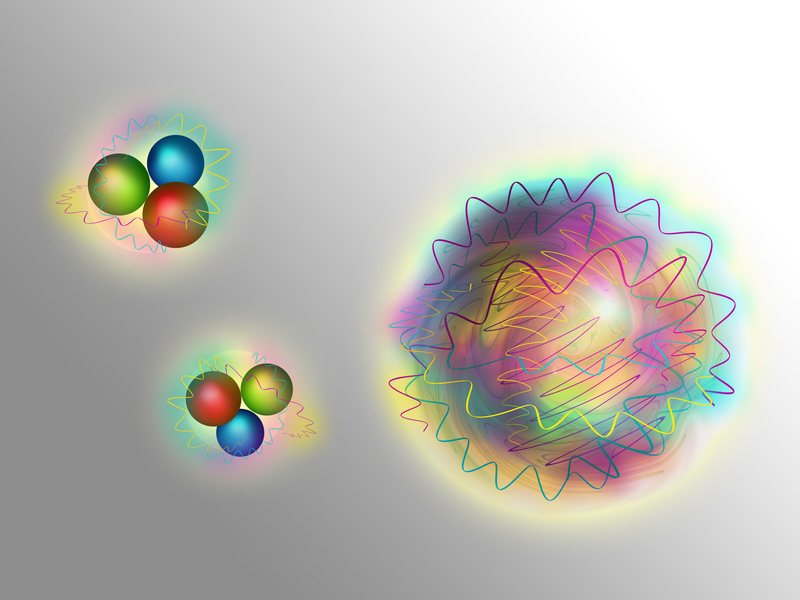 Unlike photons, there are eight different varieties of gluons and they can interact with each other to form bound states – the mysterious glueballs. Glueballs are made of pure force and they are too short-lived to be detected directly. For this reason, scientists have been trying to formulate a precise theoretical description of the decaying process of glueballs. By studying the particles that should be produced during decay, they hope to have enough information to identify glueballs in experiments. Professor Anton Rebhan and Frederic Brünner from TU Wien have used a new theoretical approach to calculate glueball decay by applying some very sophisticated physics. They analyzed possible decaying patterns by using extensions of the quantum theory to more than three dimensions with the inclusion of gravitational interactions between particles. Gravity is currently not included in general quantum theories, and the reconciliation of general relativity with quantum mechanics is one of the unsolved problems in physics. Brünner and Rebhan’s decay model is consistent with one of the two experimental candidates for glueballs. The particle is called meson f0(1710) and it has been found in a significant number of experiments across the world. More data on meson f0(1710) should hopefully be collected in the next few months, both at CERN and at the Beijing accelerator (BES-III). If f0(1710) is proven to be a glueball, there will be interesting consequences beyond particle physics. Finding evidence of gravitational interactions beyond the 4-dimensional space-time could take us a step closer to the unification of all the forces in a single theory. The paper was published in Physics Review Letters.